Moscow, February 3, Interfax – For the five years of leading the Russian Orthodox Church, Patriarch Kirill of Moscow and All Russia has realized many new things in history of the patriarchal ministry. “Many of the things His Holiness the Patriarch is doing have been done for the first time ever. The places he visits are the places first time visited by the Patriarch of Moscow,” head of the Synodal Department for External Church Relations Metropolitan Hilarion said at a round table in Moscow. 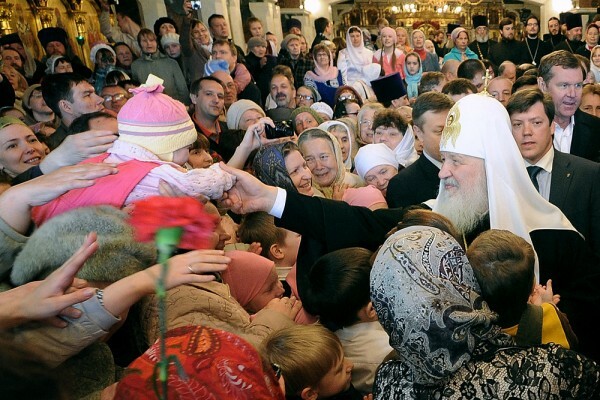 According to the metropolitan, Patriarch Kirill’s visits have never had a protocol character. “The Patriarch fills each of such visits with real, not protocol contents. It referrers to his conversations with church primates and the help the Russian Orthodox Church extends to the local Churches,” he said. Protodeacon Alexander Volkov, head of the patriarchal press service, believes the most important thing in the Patriarch’s ministry are prayers with his people, with his flock. Thus, for 1825 days of his patriarchal ministry he conducted 1132 divine services that in average make a divine service each day and a half. Head of the Synodal Information Department Vladimir Legoyda noted that during Patriarch Kirill’s term as the Primate the Church has been mentioned in the Internet four times as frequent as before. Thus, there were about 5,500 church news a month in 2009 and most of them were referred to Christmas and the Epiphany. For the first month of the current 2014 their number has reached about 20,000 informational messages. Speaking of Patriarch Kirill, head of the Synodal Department for Church and Society Relations Archpriest Vsevolod Chaplin pointed out to his ability to insist on the church position in difficult talks. “His Holiness insists on the Church’s autonomy as far as it refers to her inner order, her faith, her vision, her ability to express opinion on any public issue, its HR policy,” Father Vsevolod said. Patriarch Kirill was elected to the Moscow patriarchal see in 2009, the Russian Orthodox Church celebrates the fifth jubilee of his enthronement on February 1.